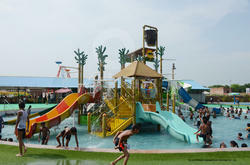 Our range of products include 5 platform water park slide, 7 platform multi water play system and swimming pool slide. 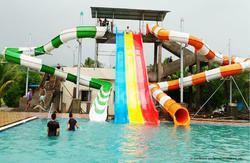 We are offering 5 Platform Water Park Slide to our client. We manufacture the wide range of Water Slides like Body Slide, Family Slide, Float Slide, Spiral slides, High Thrill Water Slide, Swimming Pool Slides etc. These Slides provide unlimited fun for all ages. This Slides are must for all Water Park , Hotels and Resort . These are manufactured as per the International standards using high grade basic materials that are procured from the reliable vendors. We are offering 7 Platform Multi Water Play System to our client. It is a multiple seater enclosed family slide in which riders simultaneously slide down in around dingy which turns over various twists and turns as it slides down & sways upwards before landing in the pool.In the field of water slide equipment, our company is recognized as a leading manufacturer, trader, and supplier of Multi Water Play System.We have marked our name very strongly in the market as manufacturers, traders, and suppliers of Multi Water Play System. We are offering Swimming Pool Slide to our client. We offer this one at extremely feasible rates as well. The company is recognized as a leading manufacturer, trader, and supplier of Combination Water Slides.This Slides can be available at different heights.We Specialized in manufacturing Theme based Water Play Systems. 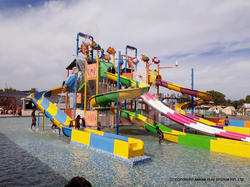 We are the company engaged in Manufacturing and Exporting a wide range of Water Slides and Water Park Equipments and guide every aspect of Water Park project in terms of Planning, Designing, Constructing, Engineering, and Commissioning. Looking for Water Park Slides ?